Jerome Kendrick "Jerry" Pate (born September 16, 1953) is an American professional golfer on the PGA Tour Champions, formerly on the PGA Tour. As a 22-year-old rookie, he won the U.S. Open in 1976. Born in Macon, Georgia, Pate grew up in the panhandle of Florida at Pensacola. He attended the University of Alabama in Tuscaloosa and played on its Crimson Tide golf team. He had a distinguished amateur career with a win at the U.S. Amateur in 1974, and was a member of victorious U.S. teams at the Eisenhower Trophy competition later that year and for the Walker Cup in May 1975 at St Andrews in Scotland. A few weeks later, he tied Walker Cup teammate Jay Haas of Wake Forest for low amateur at the U.S. Open, finishing in a six-way tie for eighteenth place at Medinah, outside Chicago. Pate turned professional in 1975, and was the medalist at the PGA Tour Qualifying Tournament at Orlando in November. 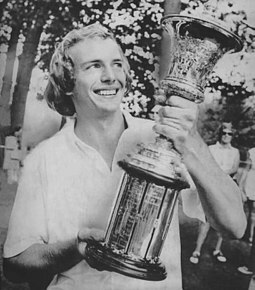 During his rookie season in 1976, he won the U.S. Open, his only major championship victory, and the Canadian Open, where he closed with a 63 to win by four strokes over runner-up Jack Nicklaus. Pate was selected as the Rookie of the Year and Co-Player of the Year. Six more tour victories followed between 1977 and 1982, as well as several other titles around the world. He was a member of the victorious Ryder Cup team in 1981, but shoulder injuries curtailed his career; his final win on the PGA Tour came at age 28. That final victory was the Tournament Players Championship in 1982, the first held at TPC at Sawgrass. Pate celebrated by throwing course designer Pete Dye and PGA Tour chief Deane Beman into the lake adjacent to the 18th green, then jumped in himself. He had also jumped in the water after a victory the previous June, after going nearly three years without a win. Pate later served as a broadcast analyst (ABC, CBS, BBC) and set up a golf course design practice and a turf and irrigation company. During the years between his regular and senior careers, Pate returned to the University of Alabama to complete his bachelor's degree in administrative science; his daughter, Jenni, received her degree at the same graduation ceremony in 2001. He designed the Kiva Dunes in 1995 and the Ol' Colony Golf Complex in 2000, which is the home course for the Alabama Crimson Tide golf team. In 2006, he earned his first Champions Tour win at the Outback Steakhouse Pro-Am. Pate has been forced by health problems, including arthroscopic left-knee surgery in 2010, to begin limiting his Champions Tour appearances. Pate now owns a golf cart and golf course design company, the Jerry Pate Company. The company is based in Pensacola, Florida with branches in Birmingham, Alabama and Atlanta, Georgia. ^ a b McKenzie, Mike (June 21, 1976). "Soozi sunshine". Tuscaloosa News. (Alabama). p. 11. ^ Deason, Lauren (February 13, 2008). "Love stories from the Tour". PGA Tour. Retrieved May 11, 2017. ^ a b Jenkins, Dan (June 28, 1976). "You were great, Jerry Pate". Sports Illustrated. p. 18. ^ a b Husar, John (June 21, 1976). "Rookie Pate beats odds, wins Open". Chicago Tribune. p. 1, sec. 6. ^ a b Mizell, Hubert (June 21, 1976). "Pate clinches Open on perfect shot". St. Petersburg Times. (Florida). p. 1C. ^ McKenzie, Mike (June 21, 1976). "Drama got it!". Tuscaloosa News. (Alabama). p. 1. ^ a b c "PGA Tour Profile – Jerry Pate". PGA Tour. Retrieved November 7, 2013. ^ "Pate: something extra in Pensacola". Daytona Beach Morning Journal. (Florida). Associated Press. October 27, 1977. p. 3C. ^ Tomashek, Tom (September 1, 1974). "Pate defeats Grace in U.S. Amateur". Chicago Tribune. p. 4, sec.3. ^ "Pate rallies by Grace". Sunday Star-News. (Wilmington, North Carolina). UPI. September 1, 1974. p. 1C. ^ "Collegian Jerry Pate wins amateur crown". Spokesman-Review. (Spokane, Washington). Associated Press. September 1, 1974. p. 3, sports. ^ "U.S. retains Walker Cup". Chicago Tribune. Associated Press. May 30, 1975. p. 4, sec. 4. ^ Tomashek, Tom (June 23, 1975). "Graham, Mahaffey in Open playoff". Chicago Tribune. p. 1, sec. 4. ^ "Medinah showdown". Tuscaloosa News. (Alabama). Associated Press. June 23, 1975. p. 9. ^ "Golf: PGA Fall Qualifying at Orlando, Fla". Chicago Tribune. November 9, 1975. p. 10, sec. 3. ^ "PGA Tour career". Jerry Pate's official site. Archived from the original on April 30, 2011. Retrieved April 29, 2011. ^ "Pate shoots 63 to beat Nicklaus". Chicago Tribune. Associated Press. July 26, 1976. p. 6, sec. 6. ^ "Jerry Pate adds another national title". Tuscaloosa News. (Alabama). Associated Press. July 26, 1976. p. 7. ^ a b c d "PGA Tour Media Guide – Jerry Pate". Retrieved November 7, 2013. ^ "Pate charges at end, then takes cool dip". Tuscaloosa News. (Alabama). Associated Press. March 22, 1982. p. 9. ^ Jenkins, Dan (March 29, 1982). "Last one in is a winner". Sports Illustrated. p. 24. ^ "In the swim of things". Chicago Tribune. March 22, 1982. p. 4, sec. 4. ^ "Pate ends drought with Memphis swim". Chicago Tribune. June 29, 1981. p. 2, sec. 4. ^ "The dry spell ends with a splash for Jerry Pate". Eugene Register-Guard. (Oregon). Associated Press. June 29, 1981. p. 5C. ^ "Jerry Pate Golf Course Design". Retrieved April 29, 2011.